PTL events, fundraisers, and donations each year amount to nearly $5,000.00? We can do more. Here are some simple ways you can help. 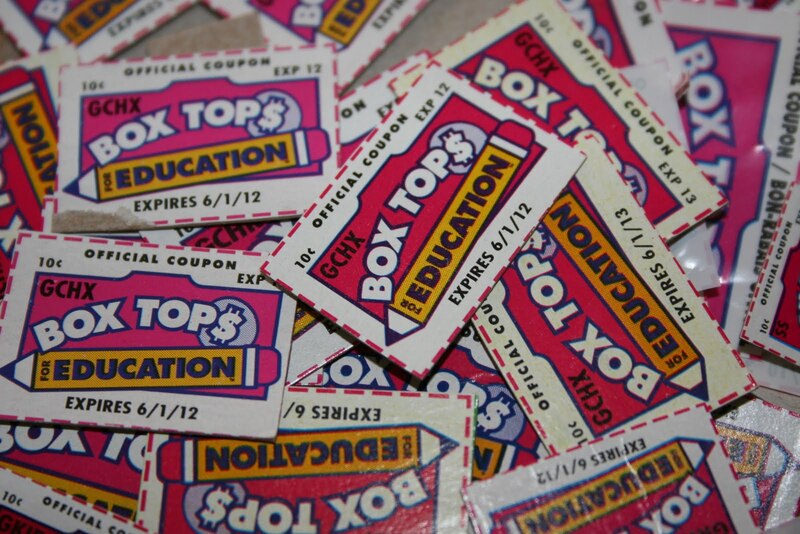 Almost $50 million dollars were raised for schools last year through Box Tops for Education. Box tops are on so many product labels, such as Betty Crocker, Hamburger Helper, Bisquick, Juicy Juice, frozen meals, and dozens of cereals. There are multiple ways to earn money for SJLS. Earn BoxTops online by shopping at participating online stores, such as WalMart, JCPenney, and Kohls. Go to Box Tops for Education to learn more. Need milk? Buy it at Kwik Trip. The caps are worth 5 cents for every cap collected. Just rinse and save. Participating products include all NaturesTouch and Kwik Quencher products. Kemp's sponsors its own Nickels for Schools program. Products such as Kemp's milk can earn 5 cents per cap! Other Kemps dairy products are included in this promotion, so clip the proof-of-purchase symbols, and bring them to school. SJLS can recycle your old ink cartridges and cell phones and earn money. Just bring them to school and we'll take them off your hands! Do you have a VISA? Make it a Target REDcard. Not only do you save 5% on your own purchases with the REDcard, but you can also designate SJLS as your favorite school, and Target will donate 1% of your REDcard purchases to our school. It's that easy! Use your shopper's card to pick a school ... SJLS! A percentage of your receipt is then given back to the school. Just go to the courtesy counter at the store to get started. SJLS will recycle your cans for you. No longer do you have to concern yourself with what days and times the recycling center is open. Just drop off your cans at the school next to the shed, and we'll take it from there! Scrip is a simple program by which vendors offer discounts for pre-paid purchases. Pre-paid purchases come in the form of gift cards. You purchase gift cards at preset amounts, and you receive credits toward your tuition. This program allows you to spend exactly the same amount you would normally spend for things like gas, groceries, restaurants, etc. It just takes a little pre-planning and you're on your way to saving money on your tuition. Cards can be purchased or ordered at school or on Sundays between church services. You can pick up an order form to help plan your purchases! St. John plans multiple pizza sales throughout the school year. Pizzas are home-made fresh and delivered to your door or your customer's door! Families, parents, and students can participate in any of the pizza sales and use a portion of the proceeds to offset tuition expenses. It is also a great way to meet people and have fun with your kids making delicious pizzas for a great cause!